Thanks to alert passerby Rob Brown, I've learned that the excavators and jackhammers have started crushing the old car dealership at Hennepin and Washington into rubble. 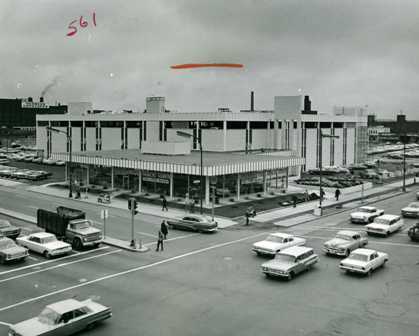 I remember the place as a Jaguar and Land Rover dealership, but Brown told me it was originally Hansord Pontiac. The voluminous Star Tribune photo archives yielded this photo of the brand new $1 million building in 1965, just a few years after the massive demolition of the old Skid Row known as the Gateway District. Where the 1965 version of redevelopment involved peddling Bonnevilles, Catalinas and Tempests, this one will sell organic arugula, trail mix and herbal supplements as a housing-retail complex anchored by a Whole Foods.